The MaM Babywearing Cover keeps your baby warm and dry in the cold season and in the summer time protected from insects and harmful sun rays. 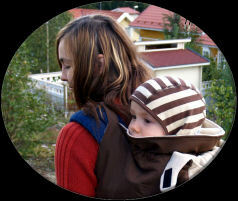 It fits over all kinds of baby slings and carriers and can as easily be used both on front and back. Your hands remains free for older siblings and/or a dog. 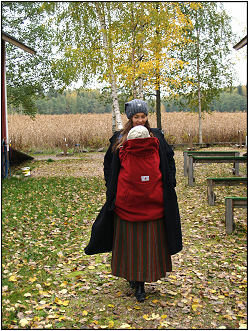 The MaM Cover has been designed and carefully tested in the Scandinavian climate to keep out the wind and has a six point closure and draw string in the hem making a lovely pouch for the feet of the child. 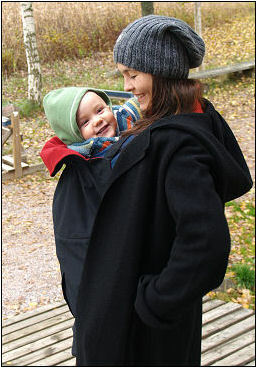 The neck of a sleeping child is supported by the cover, a feature especially appreciated by active babywearers. The head flap also works as an extra protection from sun rays/harsh weather when needed and can be folded down when the child is awake. A must have for every active parent. Can also be used as a cover for car seats and strollers and as a practical changing blanket on the go. Design: Finnish. Materials: Four-season cover: lining light polyester fleece, shell micro fibre. Extra warm winter cover: lining thick polyester fleece, shell micro fibre. Deluxe reversible winter cover: lining two layers of polyester fleece with a breathable PUL-membrane (between, shell micro fibre. All covers are fully machine washable and comes with a practical pocket in front. 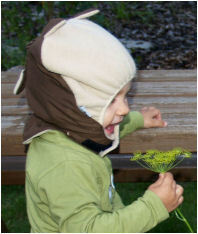 Innovation patented button-on caphoods are included with all covers. The cover is not a baby carrier. 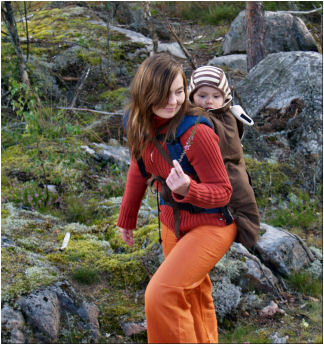 It is a garment for covering you and your baby while using a carrier. Pay attention to the security and movements of your child, especially while carrying him/her on your back. Make sure your child has good air flow at all times.